Scotch is a Whisky is made in Scotland. Distilling was first used to create perfumes and then wine and finally cereal mashes (due to grapes being unavailable in certain locations). In the 5th Century A.D., St. Patrick first introduced distilling in Ireland. Daldriadic Scots took their knowledge of distilling and brought it back to Scotland around the 13th Century where it was initially made with honey and herbs. During the 11th Century distillation was occurring at Christian Monastic sites. Monks mainly used the distilled products for medicinal purposes. The first mention of Scotch Whisky was in 1494, “Eight bolls of Malt to Friar John Cor wherewith to make aqua vitae”. He (John Cor) would go on and produce the equivalent of 1500 bottles. In 1505 it was seen that the Guild of Surgeon Barbers used aqua vitae for medicinal practices (they were actually granted a monopoly to produce it), since barbers were basically doctors and surgeons. Around 1579 Parliment restricts distillation to Earls, Lords, Barons and Gentlemen only for their personal use. As courts found out that many people were distilling spirits, they wanted to impose an excise tax during the 1600’s. For the next 150 years smuggling began to increase as well as illegal distilling. Ministers of the Kirk actually made storage space under the pulpit and even transported spirits by coffins. In 1823 a new excise tax was passed and made Whisky production legal for a small licensing fee. For Whisky production, pot distilling was mainly used to make Scotch up until Coffey Stills were introduced in 1831. Coffey Stills allowed continuous and consistent distillation and created a less intense flavored Whisky than copper pots. This spun off the Blended Whisky craze in 1840. As soon as the 1880’s hit Europe, so did the Phylloxera Beetle (1863 to be exact). This devastated the grape and wine industry and Scotch popularity exploded. 1. It can only be made in Scotland. 2. It must be distilled from malted barley, whole grains with no additional additives other than water or natural coloring. 3. It can be no more than 94.7% ABV or 189.4 Proof and no less than 40% ABV or 80 Proof. 4. It must be aged in oak casks no larger than 185 gallons for no less than 3 years in Scotland (The aging you see on the bottle represents the youngest Whisky in the bottle). Single Malt – This Whisky must come from a single distillery; distilled from malted barley in batches in copper pot stills. It can only be produced with water and no other additives. Single Grain – Distilled at a single distillery, involving water, malted barley and it may also use other whole grains of other malted or unmalted cereals (wheat, corn, barley). The word “single” means it comes from a single distillery and “grain” means there is a mixture of grain in the production. All Scotch MUST contain some malted barley. Blended Malt – Also known as Vatted Malt or Pure Malt. It is a blend of 2 or more single malts from different distilleries (Johnny Walker Green Label for example). The mixture of whiskies are matured in a barrel for a minimum of one year and it never contains any grain besides barley. Blended Grain – A blend of 2 or more single grains from different distilleries. Blended Scotch – A blend of one or more single malts with one or more single grains. Blended Scotch constitutes over 90% of the Scotch produced in Scotland. It normally consists of a neutral grain spirit and malt whisky. Blended Scotch helps to create consistency among the products produced (ex: Dewar’s, Famous Grouse). 1. 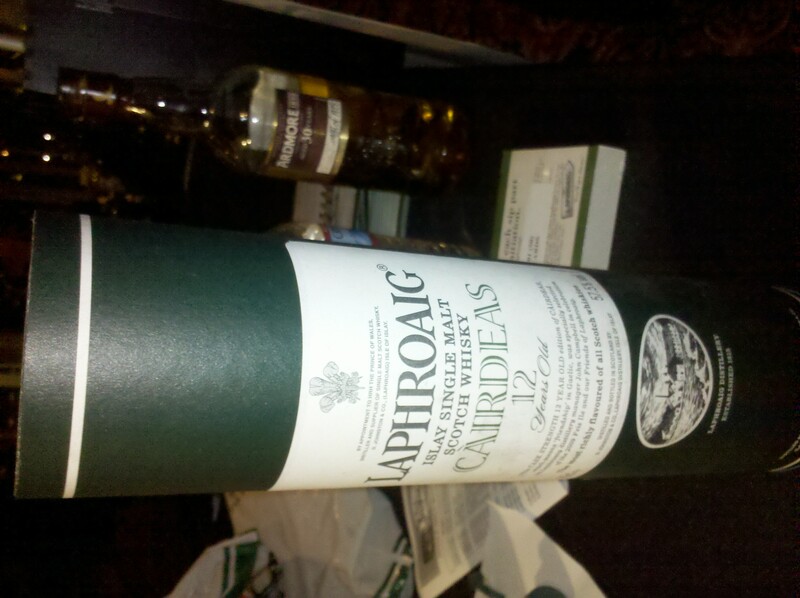 Islay – make peat smoke, salty, iodine, fruit and cooking spice flavored Scotch’s. 2. Islands – Can also be considered part of the Highlands. 3. Highlands – Produce right, robust, heather and full flavored Whisky. 4. Lowlands – Gentle and light flavors and herbal and grassy notes, barley flavors. 5. Speyside – This area has the largest number of distilleries in Scotland. It produces honey rich and fragrant Scotch. Malting – Barley is malted or steeped in water and then allowed to almost germinate. Only a few distilleries left actually floor malt their barley and turn it with large shovels. Malting helps to release enzymes that break down starches in the grain and these enzymes turn the starches into sugars. When the desired state of germination is reached, the barley is then dried over heated air or a peated fire. The peat smoke adds flavor and complexity to the finished product. Once the malted barley is dried, it will be milled or ground down to a powdered liked substance. Mashing & Fermentation – Dried malt (used for malt Whisky) or other grains (Grain Whisky) is ground or milled down into a “grist”. It is then mixed in with hot water in a mash tun and steeps. This is now called the “mash”. The barley starch is converted into sugar and creates a sugary liquid called “wort”. Wort is then transferred to a “wash back” container and is cooled down. Yeast is then added and the wort begins to ferment (sugars are converted to alcohol). This new liquid is around 5-7% alcohol and is separated from the solid matter in the tank. This liquid is now referred to as the “wash”. Distillation – The wash is now added to a Still to be distilled (either a Pot Still or Coffey Still). The distillation process will increase the alcohol content of the wash as well as remove impurities and solids. Most Scotch Whisky will be distilled twice, although there are a few known Lowland whiskies that triple distill. Malt Whisky is transferred to a wash still (pot still). The liquid is heated to its boiling point (173 F for alcohol compared to 212 F for water) and the vapor travels up the Lyne Arm into a condenser where it will cool back down into a liquid. The resulting liquid is called “low wine” and now has about 20% alcohol content. The low wine will be distilled a second time and split into 3 different cuts. 1st Cut: “Foreshots”. This can be quite toxic due to presence of methanol. It is usually distilled again to remove more impurities. 2nd Cut: “Middle Cut”. This is what is put into casks to further mature. Once it is placed in the casks, it is called “new make”. The alcohol content will range anywhere from 60-75%, but is usually 62.5% (Cask Strength). 3rd Cut: “Feints”. A weaker cut of the distillation and will be saved for further distillation. Grain Whisky is column distilled. It requires a single distillation to achieve the desired alcohol content. The maximum amount of purity that can be achieved is 94.8% ABV. Column distillation gives Blended Scotch lighter flavor than pot stills do, but consistency is better achieved. Maturation – The “new make” spirit is placed in oak casks to mature. Casks can range anywhere from used Bourbon, Sherry, Madeira, etc. Some distilleries are now even using red and white wine barrels in their aging process. This transforms the raw spirit into what we love to call “Whisky”. As with any aging of spirits, there will always be evaporation known as the “Angel’s Share”. The volume and alcohol content of the spirit reduces over time. The Scotch must be aged for 3 years and 1 day in Scotland, but most single malts will be aged around 8 years. The trained eye can tell which barrel was used in the aging process. Sherry casks impart a rich, dark amber color to the Whisky. Bourbon barrels add a golden-yellow, honey color. Vatting and Dilution – Once a single malt has been aged, it can be vatted or married with other single malts from the same distillery. It is usually diluted to 40-46% ABV. If a Scotch is cask strength, this means it is not diluted at all and is usually 50-60& ABV. If you see “single cask” on your bottle, this means your Scotch is the product of a single cask. The label will usually contain the date distilled, bottled, number of bottles produced, the number of the particular bottle and the number of the cask. Chill Filtration: Some whiskies are chill filtered before being bottled. Whisky is chilled down to 32 F and passed through a fine filter. This removes the oily and fatty compound left in the scotch from the grain or malt (Fats and Oils make a Scotch cloudy/hazy). This usually happens to a Scotch at an ABV of 46% or below. Whisky above 46% ABV is usually non-chill filtered. Unchilled usually helps the Scotch to retain more flavor due to the oils and fats being present. Broom, Dave (2000) Handbook of Whisky, London. Hamlyn.